• See the competitive landscape from a patent perspective, offering a very complementary vision to market research. • Identify key patent owners, their IP and technology strategies and their future intents. • Discover new entrants, their technologies and market areas. • Know competitors’ strengths and weaknesses in terms of patents and technologies. • Be ahead of technology trends, identify emerging technologies and know key technical solutions to solve hot technical issues. • Identify free technologies which can be used safely and to mitigate the risks of patent infringement. • Identify technologies to acquire and potential R&D partners. • Benefit from a useful Excel database with all patents analyzed in the report, including technology segmentation. In recent years, the radiofrequency (RF) GaN market has grown impressively and has reshaped the RF power device industry landscape. The GaN RF industry continues to ramp up, driven by telecom and defense applications, and with 5G implementation coming, the RF GaN market is developing fast. According to Yole Développement’s report RF GaN 2018, the total RF GaN market size is expected to increase from $380M in 2017 to $1.3B by 2023. In this report, Knowmade has thoroughly investigated the patent landscape related to GaN-based RF technologies and devices. We have selected and analyzed more than 3,750 patents published worldwide up to October 2018 and grouped into more than 1,700 patent families. These patents pertain to RF GaN epiwafers including GaN-on-SiC and GaN-on-Silicon, RF semiconductor devices, including HEMTs and HBTs, integrated circuits, including RFICs and MMICs, operating methods and packaging, for all functions, such as RF power amplifiers (PAs), RF switches and RF filters and from radio frequencies <6GHz to microwaves >6GHz and mm-waves >20GHz. Cree (Wolfspeed) indisputably has the strongest IP position, especially for GaN HEMTs on SiC substrates. Sumitomo Electric, the market leader in RF GaN devices, is well positioned but far behind Cree. Furthermore, Sumitomo Electric has been slowing down its patenting activity while other Japanese companies like Fujitsu, Toshiba and Mitsubishi Electric are increasing their patent filings and thus today have strong patent portfolios as well. 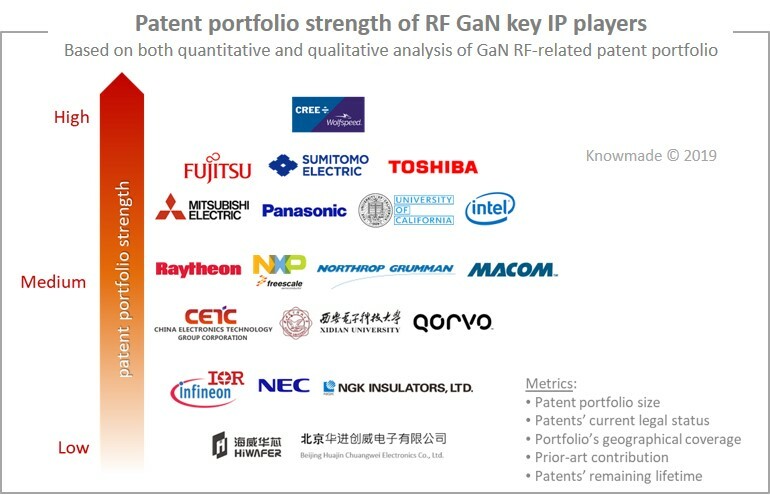 Intel and MACOM are currently the most active patent applicants for RF GaN, both especially for GaN-on-Silicon technology, and are today the main IP challengers in the RF GaN patent landscape. Other companies involved in RF GaN market, such as Qorvo, Raytheon, Northrop Grumman, NXP/Freescale, and Infineon, hold some key patents but do not necessarily have a strong IP position. CETC and Xidian University dominate the Chinese patent landscape with patents on GaN RF technologies targeting microwave and mm-wave applications. The emerging foundry HiWafer entered the IP landscape three years ago and is today the most serious Chinese IP challenger. Cree (Wolfspeed) has taken the lead in the GaN HEMT IP race for RF applications, especially for GaN-on-SiC technology, well ahead of its main IP competitors Sumitomo Electric and Fujitsu. The analysis of Cree’s RF GaN patent portfolio shows it can effectively limit patenting activity in the field and control the freedom-to-operate of other firms in most key countries. Intel, which entered the GaN HEMT patent landscape later, is currently the most active patent applicant and it should strengthen its IP position in coming years, especially for GaN-on-Silicon technology. New entrants in the GaN RF HEMT related patent landscape are mainly Chinese players like HiWafer, Sanan IC and Beijing Huajin Chuangwei Electronics. Other noticeable new entrants are Taiwan’s TSMC and Wavetek Microelectronics, Korea’s Wavice and Gigalane, Japan’s Advantest, and America’s MACOM and ON Semiconductor. In the report we detail both key patents and recent patents held by key IP players and new entrants. Only few patents explicitly claim the type of host substrate for GaN. The patent filings related to RF GaN-on-Silicon have been increasing steadily since 2011. The main patent assignees are Intel and MACOM, followed by Sumitomo Electric, Infineon, Panasonic, HiWafer, CETC, Fujitsu and Mitsubishi Electric. In the report we detail the patents claiming inventions to suppress the parasitic channel layer formed near the surface of the silicon substrate which adversely affect high frequency characteristics, and we focus on patents related to packaging for GaN-on-Silicon devices and thermal management. 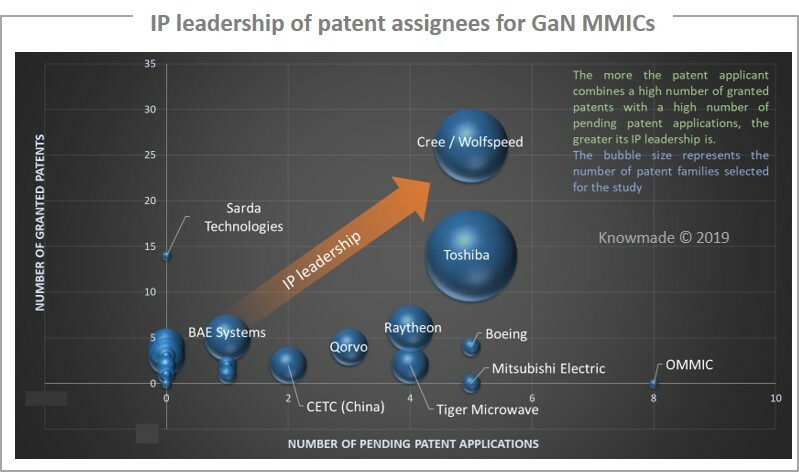 More than 30 entities have filed patents related to GaN MMICs, and Toshiba and Cree (Wolfspeed) have the most important patent portfolios. Cree has the strongest IP position in the field, but Toshiba, which entered the GaN MMIC patent landscape later, is currently the most active patent applicant and it should strengthen its IP position in coming years in view of its current patenting activity. Toshiba’s recent patents pertain to packages for GaN MMICs, and MMICs that can enhance power resistance of a capacitor connection line, which are capable of maintaining and withstanding voltages necessary for each MIM capacitor, and being downsized. The main new entrants in the GaN MMIC related patent landscape are Tiger Microwave and Beijing Huajin Chuangwei Electronics. In this report we detail the key patents owned by companies like Cree (Wolfspeed), Toshiba, Raytheon, Northrop Grumman, MACOM and Qorvo, and we focus on some patents claiming GaN-on-Silicon technology for MMICs. In the report we analyzed the relative IP position of patent assignees for functions like RF PAs, RF switches and RF filters. Cree (Wolfspeed) has taken the lead in the GaN RF PA related patent landscape. Toshiba, Fujitsu, Mitsubishi Electric, Qorvo, Raytheon and Sumitomo Electric are the other main IP players, and MACOM, which entered the GaN RF PA patent landscape later, stands out from other IP players with its increasing patenting activity. Intel is currently the most active player in terms of patent filings related to GaN RF switches, and Tagore Technology is the most notable new entrant to the field. More and more patents claim RF filters using III-nitride epitaxial layers, and currently Intel is by far the main patent applicant for GaN RF filter. Toshiba is the most active IP player, especially on packaging for RF semiconductor amplifiers and MMICs. In the report we detail patents related to plastic over-molded packages from Cree (Wolfspeed), Infineon, Sumitomo Electric, NXP/Freescale, MACOM, Mitsubishi Electric. In the report we have analyzed RF GaN-related patents claiming inventions for frequencies in the microwave/mm-wave range from CETC, Xidian University, Toshiba, Wolfspeed and HiWafer, and we highlight inventions explicitly targeting 5G wireless systems. Cree/Wolfspeed, Sumitomo Electric, Qorvo, Fujitsu, CETC (China Electronics Technology Group Corporation), Toshiba, MACOM, Mitsubishi Electric, Intel, Northrop Grumman, Panasonic, NXP/Freescale, Raytheon, Infineon/International Rectifier, HiWafer, NTT (Nippon Telegraph & Telephone), Beijing Huajin Chuangwei Electronics, Dynax Semiconductor, NGK Insulators, Samsung Electronics, NEC, HRL Laboratories, Japan Radio, TSMC, US Navy, WIN Semiconductors, BAE Systems, Lockheed Martin, Tiger Microwave, Boeing, UMS, Eridan Communications, OMMIC, Remec, Rockwell Collins, Sarda Technologies, Thales, US Monolithics, Jiangsu Broadwave Electronics Technology, UBE Industries, Xidian University, Institute of Semiconductors – Chinese Academy of Sciences, IMECAS (Institute of Microelectronics of Chinese Academy of Sciences), ETRI (Electronics & Telecommunications Research Institute), UESTC (University of Electronic Science & Technology of China), University of California, Fudan University, South China University of Technology, SINANO (Suzhou Institute of Nano Technology & Nano Bionics – Chinese Academy of Sciences), Hangzhou Dianzi University, KETI (Korea Electronics Technology Institute), CEA (French Alternatives Energies and Atomic Energy Commission), etc.